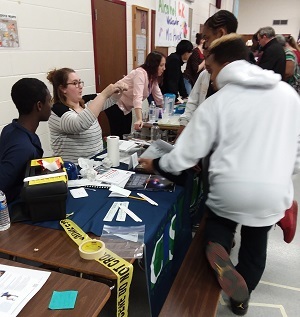 The Mount St. Mary's University Criminal Justice Student Association (CJSA) table at Monocacy Middle School's STEM Fair drew a crowd as Mount students demonstrated various forensic science procedures and forensic examinations used by law enforcement in criminal investigations. At the event, held on March 14, or PI Day, CJSA President Kayla Pahl, C'19, Vice President Joseph Graham, C'19, and club member Thomas Reilly, C'20, assisted middle-school students in performing hands-on latent fingerprint collection, DNA swabbing, and other crime scene investigative techniques. Mount students fielded a variety of questions concerning law enforcement procedures as well as the importance of education and training that are required to obtain a career in law enforcement, intelligence and cybersecurity. Middle school students, parents and school faculty were impressed with the expertise and professionalism of the Mount’s CJSA students. The Mount was well represented at the fair with Professor Athar Rafiq and a student manning a table on cybersecurity that also was popular.